Last night, we went out to dinner for my friend Jenna's Birthday, which she kept insisting didn't count because her actual birthday wasn't until the weekend. Regardless, we considered it a birthday celebration and kept it as such. Hubby and I asked my sister to watch Reese so we could go out to dinner. It was the first day we have EVER both left her and the first time I haven't been there for her bedtime. It was so hard to leave our littlest boo, but we did it and actually had a great time. I got dressed in one of the three dresses that fits me now my favorite black dress and my fav little shoes I found for a steal at Charolette Russe a few years ago. I, of course made Hubby wear a shirt that matched my shoes his favorite shirt, too. There were 4 couples total and we had a great time where the food and wine seemed never ending. I called Reese at bedtime to say goodnight, but other than that we did really well on our first night out. I love having Reese (obvi) but it was really nice to just be Ashley again. Any other moms know what I'm talking about? And did I mention the cake? I made Jenna a DELICIOUS chocolate mint cake for her birthday. 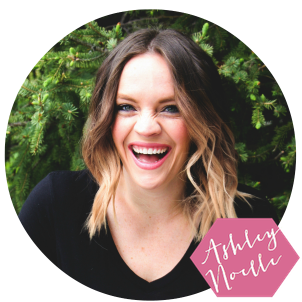 Since all her amazing readers have been so kind to me on this blog, since she asked so very nicely, and since I totally forgot to bring her a birthday card, I'll share the recipe on here. It is basically a chocolate cake with chocolate ganache. The not-so-secret ingredient is those little yorkshire peppermint patties spread throughout the batter. They melt while it's being cooked and diffuse that creamy mint flavor throughout the cake. It is so delicious. I found the recipe a few years ago when I was looking for a birthday cake for Hubby. The original recipe is not my own, but I have made a few changes to it. It is amazing and worth sharing. 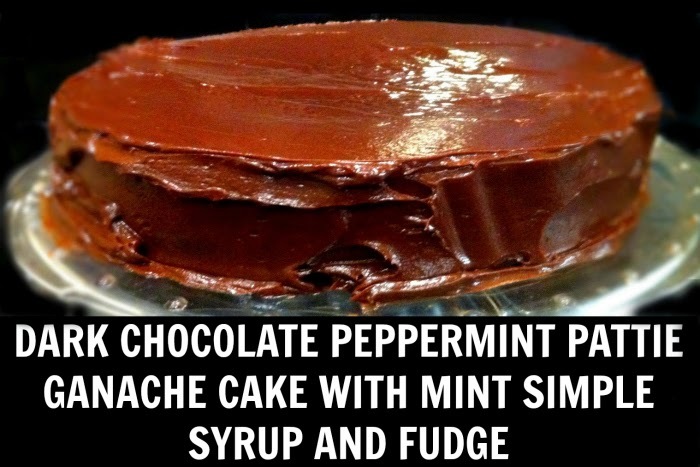 Also, if you are going to make this cake make sure to make the ganache and the mint simple syrup ahead of time. and while you're at it, you might as well make the fudge sauce early, too. Heat the cream on very low heat in a saucepan to just under a boil. Add the chopped chocolate and cook, constantly stirring, until well mixed and smooth. Strain through a fine mesh strainer and allow to cool to room temperature, stirring occasionally. This can take a few hours so I normally make the ganache first. Ganache should be smooth, creamy, and spreadable. Bring a small saucepan of water to a boil. Blanch the mint for about 10 seconds then immediately move to a waiting ice bath to set the color. Strain the mint and move it to a food processor. Mix the sugar and water in a small sauce pan and bring to a boil. Turn the heat down and simmer several minutes, until the sugar is completely dissolved. Strain the mint and move it to a food processor. Once the sugar is dissolved into the water, pour the simple syrup into the food processor and blend for 2 minutes. Allow the mix to sit in the fridge overnight to get the most concentrated mint flavor. Strain the syrup through a fine mesh strainer- or you can, like me, totally forget and just eat the sauce un-strained. Melt the butter in a saucepan. Whisk in sugar, cocoa, cream and salt. Bring to a simmer over medium low heat, whisking often for 8 minutes. Remove from heat, add the vanilla and strain though a fine sieve. Preheat oven to 350. Melt the chocolate, butter and cream in the top of a double boiler. With a clean whip, beat the egg whites to medium soft peaks. In a separate bowl, beat egg yolks and sugar for a few minutes until very light in color. Add the melted chocolate mixture to the egg yolks and mix until just blended. Mix in the flour, salt, and vanilla. Stir in the Peppermint Pattie pieces. Stir in about one-third of the egg whites then fold in the remaining whites and the place batter in a prepared 9 1/2- 10" circular spring form pan. Bake at 350 degrees F for 45 to 50 minutes. Remove and cool in the pan on a rack. Place the cooled cake upside down. Remove the sides and bottom of the spring form pan. Spread the ganache over the cake as you would any other icing. Serve with a dollop of whipped cream and top with Chocolate Fudge and Mint Simple Syrup. I have a 4 year old and I can count the number of times I've missed her bed time on my hand, it's not easy! But it is always nice to have that total adult time. glad you had a good time,and adult time,no kids,is always fun! btw that cake looks yummy yummy,too bad I dont bake!